Relive the Star Wars series in fantastic fashion with some excellent artwork reimagining the poster artwork for the famed film franchise! 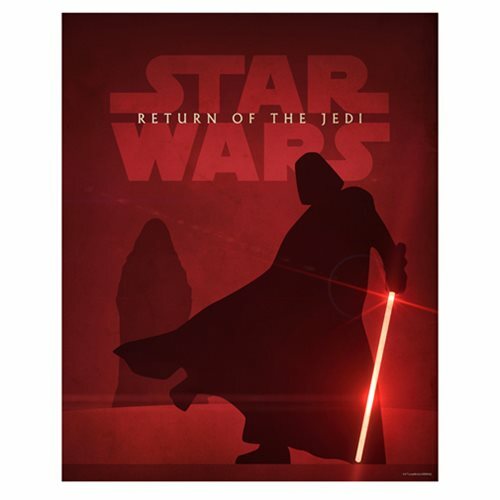 This Star Wars: Episode VI - Return of the Jedi by Jason Christman Lithograph Art Print shows what the Star Wars: Episode VI - Return of the Jedi poster could have originally looked like if Jason Christman had been the designer behind the poster art. Painted on a cool red background, the Star Wars: Episode VI - Return of the Jedi symbol is emblazoned large above silhouetted images of Darth Vader and Emperor Palpatine. A limited edition of 200 hand-numbered pieces, this giclee measures 20-inches tall x 16-inches wide! Comes complete with certificate of authenticity.